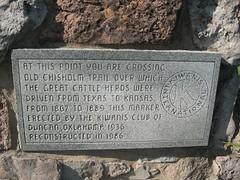 At this point you are crossing Old Chisholm Trail over which the great cattle herds were driven from Texas to Kansas. 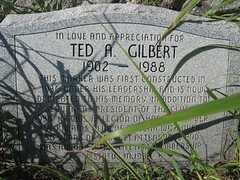 From 1867 to 1889. 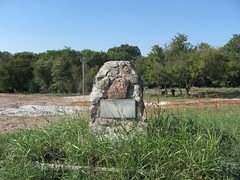 This marker erected by the Kiwanis club of Duncan, Oklahoma 1936. 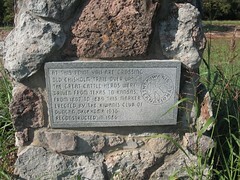 This marker was first constructed in 1936 under the leadership and is now dedicated to his memory, in addition to serving as President of the Club in 1936. He was a Legion of Honor member of the Kiwanis Club of Duncan with over 50 years of perfect attendance and was awarded the lifetime membership status in 1987. 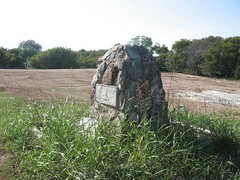 Highway 7 on the south edge of Duncan, OK. East to Eastland Dr. take first road east (Old Highway 7) go 2 miles marker is on north side of road.